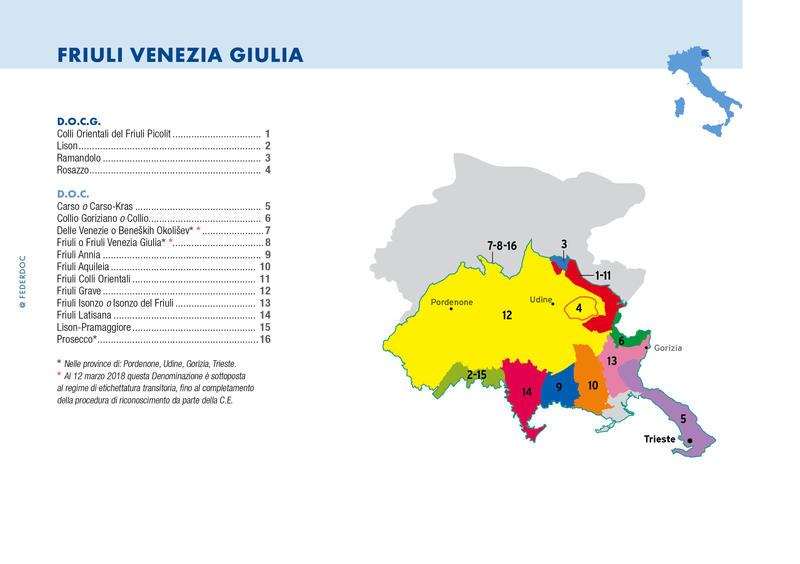 Friuli-Venezia Giulia produces 4% of Italy’s wine (12th in volume among the regions), with white wine accounting for 60% of its production. The regional output includes 65% DOC/DOCG and 20% IGT. Drawing from both native and international varieties, Friulians have applied studied vineyard techniques and avant-garde enology to the production of highly distinctive whites, as well as some eminently attractive reds. Friuli has a glowing reputation for white wines made by relatively small wineries and estates. Tocai Friulano has always been the leader of the pack, but in 2007 was forced to change its name to “Friulano,” to avoid conflict with the Tokay wine of Hungary. Friuli has 2 DOC zones of outstanding class in Collio Goriziano and Colli Orientali del Friuli, as well as 2 rare DOCG sweet white wines, Ramandolo, from the Verduzzo grape, and Picolit, which was ranked as one of Europe’s finest sweet wines around 1800, when it was favored by the Hapsburgs and other royal families. The Isonzo area produces delightful, approachable wines on its complex gravel soils, while some highly mineral, intriguing wines are coming from the unique limestone cliffs of the Carso area. Friuli’s reds are often light and fruity, best to drink within two to five years of the harvest, however the region is also known for producing reds with excellent aging capacity, most notably from the Refosco, Pignol and Schioppettino grapes. Friulian winemakers have also created nuanced wines using Cabernet Sauvignon, Merlot and other international varieties.